So when a promo copy of OOTW arrived here at ELO Beatles Forever [ELOBF] yesterday morning all the way from Lewisville, Texas, USA - thanks to the kindness of its creator Michael Laine Hildebrandt - and with a bad back preventing me from doing anything but listen to it - I had an ideal opportunity to make myself familiar with this production. OOTW is a tribute - first and foremost - to the ELO genre; sound and imagery as well as the song writing and production prowess of Jeff Lynne. But it is also a remarkable example of the musical talent of Mr. Hildebrandt who - with a little help from his friends - has written, performed, recorded and produced this great album in deference to his love of the seventies heyday of string-swept, orchestral classic rock music. 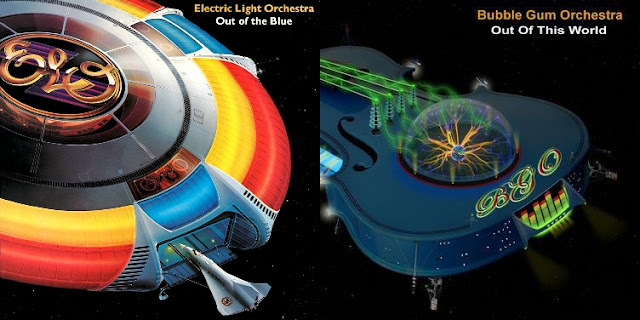 The whole album is musically and lyrically replete with references to our favourite ELO songs both in terms of song titles and themes as well as the bridges and orchestral [although synthesized] underpinning we came to expect back then [and even now]. The songs about all things light; blue; rain; sunshine; regret and love do strike a chord to the staid ELO fan. Agnes Is Back: An intro where the backward messages of "Fire On High" and "Secret Messages" meet head on is followed by a great up-beat opener citing not a few ELO song titles. Night In Shangri-La: the lead single from the album also citing those ELO tracks and very catchy! Lights Over London: 'B' side of the lead single and full of love lorn angst. Lonely Girl: familiar themes of lonely nights and long distance love via the telephone. Reversible Relationships: recalls the yearning of time travel backwards to better days. Yesterday Tomorrow Tonight: Nice drum work here in a song of starry nights and a world of blue and sunny days gone wrong. Goodbye My Old Friend: A song not dissimilar in construction to "Hello My Old Friend" with those broken interludes but also reminiscent of "Time" with those "Yellow jackets in purple flowers". Where Are You Now: Without a doubt this song gives a huge nod to "Believe Me Now" and at the same time a really nice piece of work. Sky Has Turned Blue: Filled with references to those familiar ELO topics of sky and blue; "The Way Life's Meant To Be" and fate. Concerto For A Sad Day - Feeling Down: Another nod - this time to "Concerto For A Rainy Day" - but this song urges you to "Hold On Tight" to your dreams even when you're down. The Wheels Keep On Turnin': The only similarity to "Big Wheels" here is in the title ... but this is a lovely song that reminds me more of "It's Over". Summer Day: Replete with [finally] a reference to Bubble Gum! This song is a jolly confident song of the hope of returning love. Happy Song: This song is a bubbly tribute to "Mr. Blue Sky" in all but name ... a marvellous ditty! Girl I'm Gonna Miss You: Nice vocal work on this one both in the fore and background as we witness that "summer came and passed away" and a love has departed. Sunrise In Spain: An instrumental song where "Letter From Spain" meets "Across The Border" in part with its flamenco [and Texan!] influences! All I Wanna Do: With an intro that alludes to the sonic resonance of "The Whale"; this song is a forlorn item of few lyrics in the same style as "Letter From Spain". Love Never Goes As Planned: This sweet final track quotes "Times holds the answers" and "The stars that keep us dreaming" as a nice piece of guitar work with plucked strings sails on bemoaning the quirky ways of love. Yours Truly KJS is pleased to announce that ELOBF will be conducting a long distance interview with Michael and BGO in the near future in order to ask a not a few questions about the project and to support BGO with this likable and enjoyable new release. 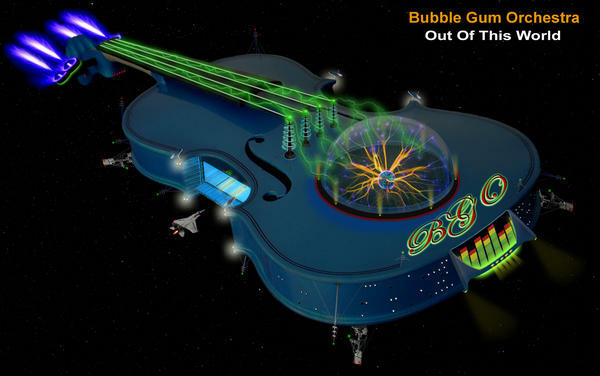 ELO Beatles Forever [ELOBF] recommends "Out Of This World" by Bubble Gum Orchestra to those enlightened folks who enjoy the music of ELO, Jeff Lynne, Roy Wood, The Move, The Idle Race, 'Brum Beat', The Beatles and related artistes.